In fact, one of my favorite apocryphal facts (and if anyone has information in support or dispute of this, I’d love to hear it) is the story of how Chardonnay came to be named that. Most French wine grapes are named for the region in which they are grown. Champagne, Bordeaux or Burgundy, for example. But there is no Chardonnay region, so the question is where the grape got its name. Supposedly — as I have heard — when the Crusaders came to Israel, they wanted to bring a piece of the Holy Land back home with them, and knew of the famed grapes of Israel. So they brought some of them back to france and named them for the land itself — Sha’ar L’Adonai, the Gate to God. As I say, I have no idea if that is true, but it is a good tale nonetheless, and it indicates the fame of Israeli wines. With the return of Jews to Israel in larger numbers through the 1800s, and the birth of the Zionist movement in the late 1800s, wine again became one of them most important industries here. That same Carmel Wineries company was started in 1882 by the Baron Edmond de Rothschild in 1882, and gave jobs and livelihood to many of the Zionist pioneers. It grew with Israel itself, and for about 100 years it held a virtual monopoly on wine production in the country. Most of the country’s grapes were sold collectively to Carmel. 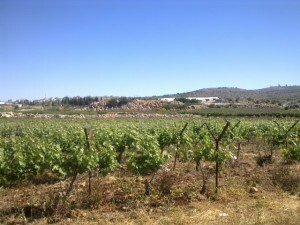 One of the first wineries to compete and break that monopoly is also one of the more celebrated of the country’s wineries — The Golan Heights Winery. 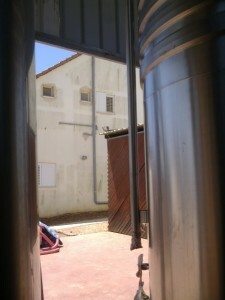 It released its first vintage in 1984, and thus was launched a revolution in Israeli wine production. Today, in a country approximately the size of New Jersey, we have somewhere between 250 and 300 wineries! Some of them are tiny Mom-and-Pop operations, some are boutique sized, and the biggest produce tens of millions of bottles per year. And the quality overall has greatly improved, with Israeli wines winning awards at many international festivals and competitions. A visit to one or more wineries can add a nice dimension to a tour in Israel, be it a single winery in the context of a general touring itinerary, a full-day visit to multiple wineries or a single stop in a tour full of more diverse culinary adventures. So how about the wineries we visited on this day? For starters, I’ll say that all of the wineries we visited were kosher, though certainly not all of the wineries in Israel are certified kosher. And for those who don’t yet know that kosher wines do not have to be sweet or poor quality, just do a Google search. You will find any number of articles making just this point, and I don’t feel the need to waste time or energy on repeating the message! Also interesting was the fact that each of these five wineries was really quite different from one another. Lots of diversity in a small region. Getting a tasting of Tanya's wine, straight from the barrel. A rare treat. Our first stop was at the quaint Tanya Wineryin Ofra. The smallest of the five, producing only 12,000 bottles a year, they were also one of the most pleasant ones to visit. The winery’s visitors center — an apparently hand-built rustic structure covering an outdoor table and entrances to the cave-like barrel room and a separate tasting area — is about a 3 minute walk from their vineyards. It sits outside the house of the winery’s owner and winemaker, Yoram Cohen. I hear Yoram is quite a character, but for our visit we were guided by a very pleasant, soft-spoken and humorous man named Yossi (that’s him in the picture up above), who is basically Yoram’s right-hand man. One of the special experiences you get with a visit to Tanya is the ability to taste wine straight from the barrel. This is a rare treat that you don’t get at most wineries, though I think it would be even better if we also got a taste of the wine in the bottle for comparison. But I’m not complaining. We tasted a Cabernet Sauvignon and a Merlot. The Cab was surprisingly smooth and gentle, and both were quite nice in general. Tanya bears Yoram’s family touch everywhere. The winery is named for his daughter, and their four lines of wine are named for 4 of his other children: Ivri, Hallel, Eliya and Enosh. And in the outdoor tasting area, small sculptures made by Yoram’s wife adorn the walls. 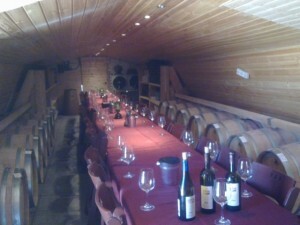 Overall, our visit to Tanya was a truly pleasant experience, and with good wine to boot. 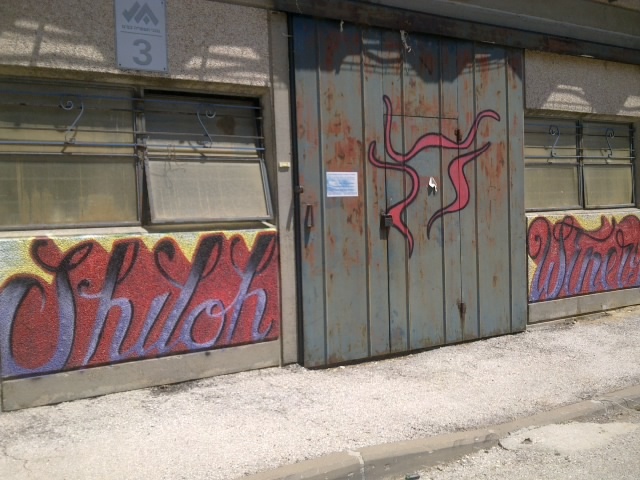 From Tanya, we drove to the small town of Rehelim for a visit at Tura Estate Winery. Named for the women named Rachel, both killed in terror attacks on the road nearby in past years, Rehelim is a small settlement and the relaxed feel of the town also impacts the feel of the winery itself. The Tura visitors center has recently been renovated, and is located in a unique building with some interesting history to it. Additionally, Vered Ben Saadon, the owner (with her husband) of the winery who gave us the tour and tasting, has an interesting story of her own. The stories of the winery and the people involved is a nice addition that you get with a visit to Tura. Established in 2003, Tura now produces about 15,000 bottle per year. We began our tasting with a 2010 Chardonnay, their first vintage of this varietal. It was nice and crisp as a starter. From there, we moved on to a 2008 Cab, aged for a long 22 months in the barrel. The same grapes were used to produce their 2008 Port, a late harvest Cab with a whopping 20% alcohol content. In general, I am not a Port fan, never having tasted one that I really liked. So when I say that this one was “not bad,” that’s actually a high compliment! In addition to the wines, we also got tastings of a few of the company’s other products — an olive oil and an apple cider. Vered told us that they were the first in Israel to produce cider (or “hard cider” as it is called in the States), though I’m more familiar with Side Effect cider from Kibbutz El Rom in the Golan Heights. They have done a better job of getting to market, because they are part owned by the Golan Heights Winery, a very large company. Still, while I thought Tura’s cider was nice, I like the drier Side Effect cider better. Talk about a cottage industry... Har Bracha's fermentation tanks sit on the side of the winemaker's house! 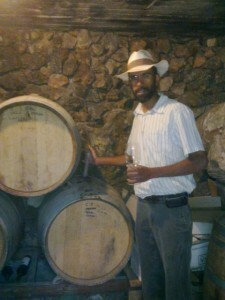 I had met Amir from Har Bracha / Mount Blessing Winery a few times in the past at various wine and tourism events. He is one of the two brothers-in-law in charge of the winery, and is a very nice and passionate guy. 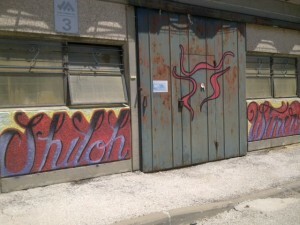 Still, I wasn’t prepared for what I found when I arrived in the town of Bracha where they are located. The signage inside the settlement directed us to an average house at the edge of town, and sitting on the side of the house, right there in the yard, are the four large fermentation tanks! All of the processing is done right there, including pressing, remontage and filtering. One of the interesting aspects of Har Bracha’s story is that they are assisted in their annual harvest by Evangelical Christian volunteers, brought by Tommy Waller. Amir had nothing but the highest praise for this group of volunteers. Har Bracha is in the midst of an expansion. They recently received an investment from a foreign businessman, and have gotten production up to about 25,000 bottles a year. They currently are producing grapes on 40 dunams of land, but they have another 50 that are not yet producing. Their small visitors center was where we ate our lunch — a nice spread of pita, salads, spreads and cheeses. The expansion of their visitors center and move of the production facility alongside it are plans that will continue their expansion, along with an expansion into the cultivation of other grape varietals. We tasted their 2009 Cabernet Sauvignon, blended with 10% Merlot and 5% Petit Verdot. It was certainly a nice wine, but the star of the day for a few of us was Har Bracha’s 2009 Merlot. Delicious, complex and smooth it had some very nice berry flavors. Har Bracha is a bit more isolated, which might keep some people away. But it is well worth the visit for the slightly more adventurous. By far the largest winery we visited (though still tiny by comparison to other wineries around Israel) was the Shiloh Winery, located in the town of Shiloh, site of where the Mishkan / Tabernacle stood before Solomon built the First Temple. Producing 70,000 bottles per year, they were established in 2005 with Amichai Luria at the helm as Master Winemaker. He is truly involved in every aspect of the winery’s affairs. As he gave us our tour, he joked that in addition to overseeing the harvest, production, blending and various tours, he also even mops the floors at the end of the day! One of the draws of a visit to Shiloh is Amichai’s desire to create unique wine experiences for even more knowledgeable visitors, tailoring tours to individual needs and desires. He told us of one group, for example, that in the same day met him at one of the vineyards in the upper Galilee to help with picking the grapes, and then met him back at Shiloh on the same day to participate in the initial grape crushing! Another unique option he mentioned was the opportunity to sample various individual wines and participate, with his guidance, in creating a blend of them. It is clear that Amichai is passionate about what he does, and he wants people who have visited to find reasons to come back for repeat visits. Plus, the winery’s location just a minute’s drive from the ancient tell of Shiloh makes a combination visit a lovely possibility. The test lab set up right inside of Gvaot's small tasting room. Our final stop of the day was right across the highway from Shiloh. Gvaot Boutique Wineryis located on a hilltop overlooking Nahal Shiloh. The gorgeous scenery surrounding the winery certainly is a large part of its charm, as is the vineyard literally located mere steps from the small winery building. We tasted their Gofna line Chardonnay 2011. It was impressively full-bodied, no doubt due in part to the 20% Cabernet Sauvignon grapes blended into it. Established in 2005 and now producing about 30,000 bottle per year, the winery grows grapes on 20 dunams of land, but buys half of their grapes from other vineyards in the region. In their early years, they produced special-label wines for some high-end Israeli restaurants. One of the more entertaining features of this tiny winery is that the laboratory in which they test the pH of the wine, and other specific chemical aspects is sitting inside of the small tasting area. 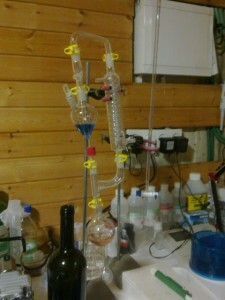 It looks like someone’s high-school laboratory chemistry set, but the fact that they unassumingly leave it sitting on the side of the tasting room shows how unassuming and down to Earth the Gvaot Winery is. All in all, this was a really lovely day, and I hope to do similar days in other regions of the country. I also look forward to sharing some or all of these wineries with many visiting tourists. 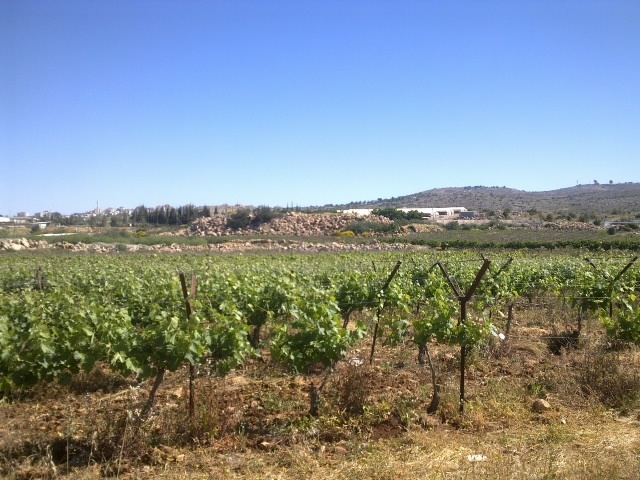 I just came back from Har Bracha, was out there with The Waller’s pruning. I only got home with a couple bottles of wine. Do you know how we can purchase this wine in the states? Hey there, Duane! Congrats on doing that, and I trust that you enjoyed yourself! Thanks for helping our country to thrive. Hopefully they can help you! Indeed the wines are sold in the US, you can get the 2009 Highlander Cab and Merlot and now the 2011 baseline wines and the 2010 Highlanders as well. Where do you live? They are being sold mostly on the east coast and many of the stores that sell them ship. Can you tell me which of these wineries may have a restaurant or deli on site? The only one that had something like a restaurant when I was there was Har Bracha. Not sure what the story is now, since things change periodically in that area.